A very decorative and functional design that’s full of character. 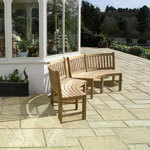 Contour Benches are for great for use individually or as a set for a variety of purposes. Whether it be round the base of a tree, in an indented space or along a curved section of wall the contoured shape gives you more options than with a standard garden bench. They’re hand crafted from the finest teak that looks great with its golden lustre and super-smooth finish making each and every one a stunning example of the finest craftsmanship. The slightly angled back is a built in comfort factor and you’ll notice there’s three leg sections complete with bottom stretcher to guard against any ‘wobble’ occurring over time. The unit is further protected by tough plastic caps on the legs to raise it off the floor slightly. In accordance with our quality specifications the various parts are secured with hand cut mortice and tenon joints reinforced with teak dowels to ensure maximum strength. This is a quality you don’t find with many mass produced benches that tend to have a bolted construction not well suited to regular use over time. We use teak for most of our benches because it has a very dense grain and is full of natural oils that offer natural protection against the elements all year round, reducing the likelihood of cracking or splitting and protecting against rot as well. Simply position it in your outdoor space and watch it age gracefully to that beautiful silver-grey patina that looks so good. The ageing process can be removed either manually with mild soapy water or, for a less backbreaking experience you can use our Teak Care Products. For further help and support please call our friendly Sales Team in the Midlands.